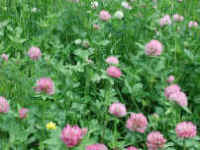 (Red Clover (Trifolium pratense) - 01) This is a photo of a typical field of red clover. Note the chevron pattern in the three palmate leaves (most evident in the lower right of the photo), which is a characteristic of this species of clover. Also blooming in this field are white clover (top of photo) and a yellow birdsfoot trefoil (lower left of the photo). (Red Clover (Trifolium pratense) - 02) At first glance, the bloom of the red clover may look like a single flower; but it is really a cluster of many tiny flowers, each projecting out from the center about 3/8 of an inch. 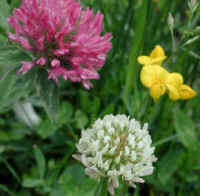 Though one might suspect that clovers are members of the Composite family, they are really members of the Pea family (Leguminosae). 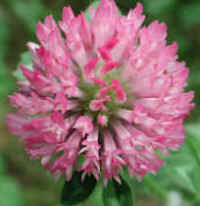 There are approximately 75 species of clover in the United States, but only about 20 are found in the East. (Red Clover (Trifolium pratense) - 02a) In this photo (enlarged more than 15 times) we can see the detail of some of the individual tubular shaped flowers that make up the cluster bloom of the red clover. I find it hard to understand how anyone could look upon the detail, the complexity, and the beauty of this common wildflower, and fail to see upon it the signature of God. 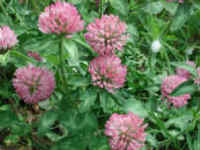 (Red Clover (Trifolium pratense) - 03) The Native Americans used the leaves of the red clover in salads, soups, and stews; and the early European settlers used the dried flowers to make a tea that was thought to be good for boils and other skin eruptions. 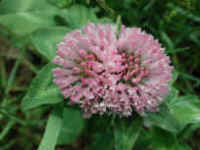 Note that the stems of the red clover are "fuzzy". The white foamy substance (upper right of the photo) was deposited by a spittle bug larva. (Red Clover (Trifolium pratense) - 04) In this photo of a red clover bloom, some of the individual flowers are unopened. The literature says that red clover bloom from May through September, but we have seen them bloom as late as November, or until the first hard frost. (Red Clover (Trifolium pratense) - 05) This red clover and its white clover cousin join together with their neighbor, a birdsfoot trefoil, to form one of nature's beautiful living bouquets. 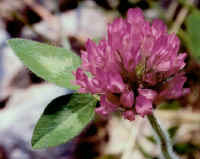 (Red Clover (Trifolium pratense) - 06) This photo of red clover was taken by Dianne Stoess, who submitted it to us on 28 July 2003, with our thanks.